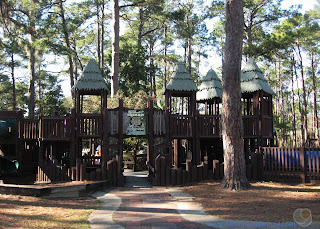 Description: Albany, Georgia is home to a beautiful park with a zoo located inside. 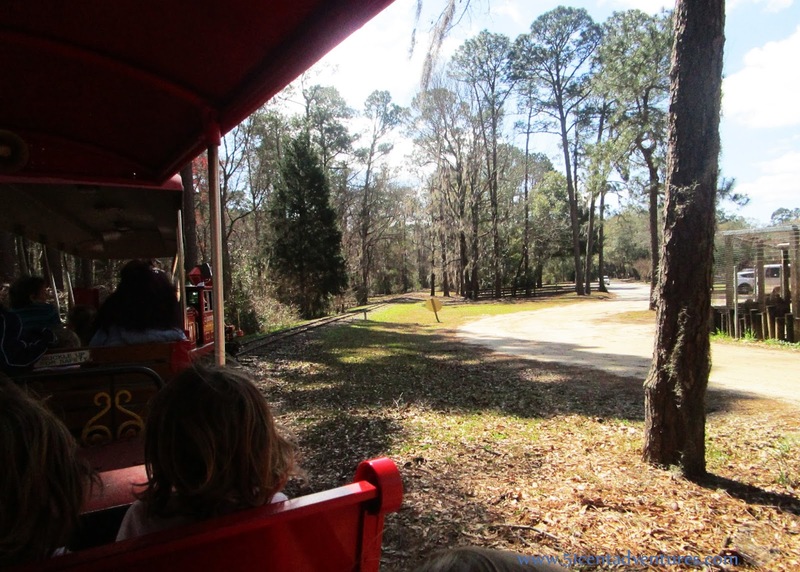 In addition to the zoo, Chehaw Park has a campground, a disk golf course, a BMX bike track, an amazing playground, and a 20 minute train ride. 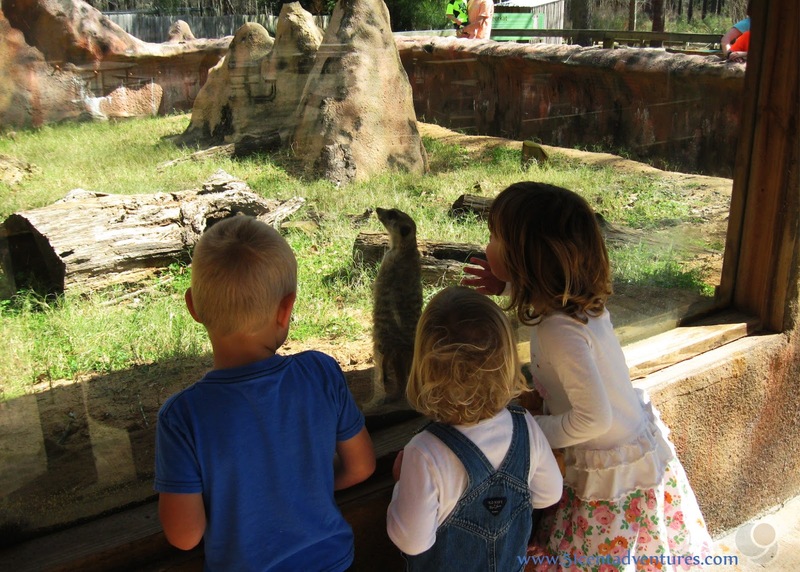 The zoo within the park is home to over 80 different species of animals including kangaroos, rhinoceros, emus, alligators, a cheetah, and more. There are tall trees that provide plenty of shade throughout the park and zoo. A visit to this zoo will be enjoyable any time of year. Location: 105 Chehaw Park Road in Albany, Georgia. 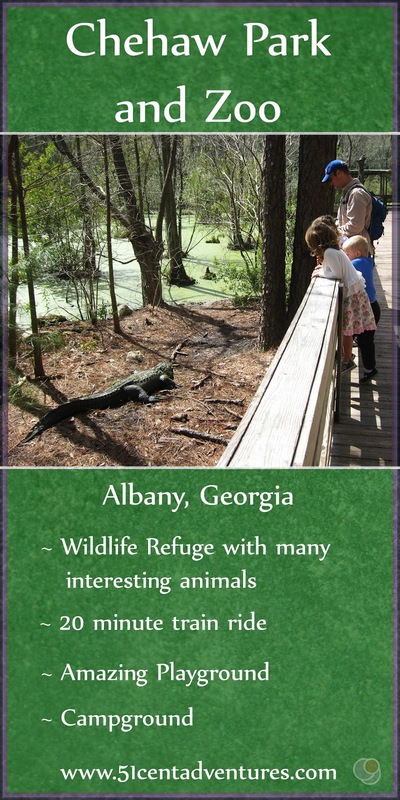 Albany is located in southwestern Georgia about 200 miles south of Atlanta. Cost: Tickets to the park cost $3.00 for adults and $2 for children age 4-12. Tickets to the Zoo are an additional $7.85 for adults and $5.10 for children ages 4-12. Military members and seniors get in for a child's rate. There is also a 20 minute train ride that costs $3 a ticket for anyone over the age of 1. Camping costs $15 per night for tent sites and $28 per night for RV hookups. Operating Seasons and Hours: The park is open from 8:00 am to 6:00 pm Monday through Sunday. The zoo is open from 9:30 am to 5:00 pm Monday through Sunday. My kids love zoos. The problem is that zoos can be expensive. 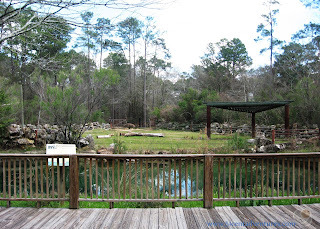 Back in Texas we fell in love with the Cameron Park Zoo in Waco, Texas. That zoo was perfect. It was big enough that it had animals such as elephants and giraffes, but it was small enough that my kids could walk around the whole place. Also the price was amazing. Only $9 for adults and $6 for children over three. 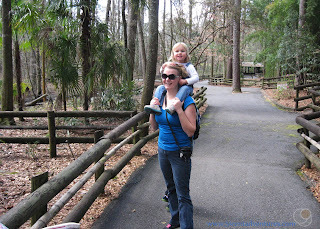 We also occasionally went to the Houston Zoo where we were able to get in for free with our military IDs. I didn't realize how spoiled we'd been with zoos back in Texas until I had trouble finding a zoo we could afford when we moved to Alabama. Everyone said that the Montgomery Zoo was amazing - and I believed them, but the cost of admission kept me from taking my family there. An adult ticket is $15 and children's tickets are $11. For my family to go it would cost $63, and that's if we didn't add on the extra $29 for the zoo museum. That's not exactly a 51 Cent Adventure type of adventure. A few weeks ago Fort Rucker hosted a travel expo to help people learn about the interesting thing to see and do in the area. I went because travel is kind of my thing, and I was sure that there were things in the area that I hadn't heard about. One of the booths was for Albany, Georgia. The lady at that booth mentioned that Chehaw Park in Albany had a really cute zoo. I looked up Chehaw Zoo when I got home, and found that it cost significantly less than the Montgomery Zoo. A visit to the park and zoo would cost a little over $30 for our whole family. That price was low enough to make me want to plan a visit to Albany right away. I also found out there was a train ride available. I read that the train would start running in March so we delayed our visit by a week so we could be there when the train was running. The train cost $3 a ticket which meant it would be $18 for all six of us. That put the total for the visit to Chehaw up at almost $50. That was still less expensive than what the Montgomery Zoo would cost. On the first weekend of March we got ready for a day trip to Albany, Georgia. We had to drive 2 and a half hours to get to Albany, but that was only one hour more than we would have had to drive to go up to Montgomery so I didn't think it was that bad of a drive. When we arrived I immediately knew that it would be an awesome day. Everything was so green and there were trees everywhere. The zoo even seemed similar to our beloved Cameron Park Zoo which was a very good sign. Within minutes the kids were running from exhibit to exhibit and happily proclaiming that this was the "best place ever!" 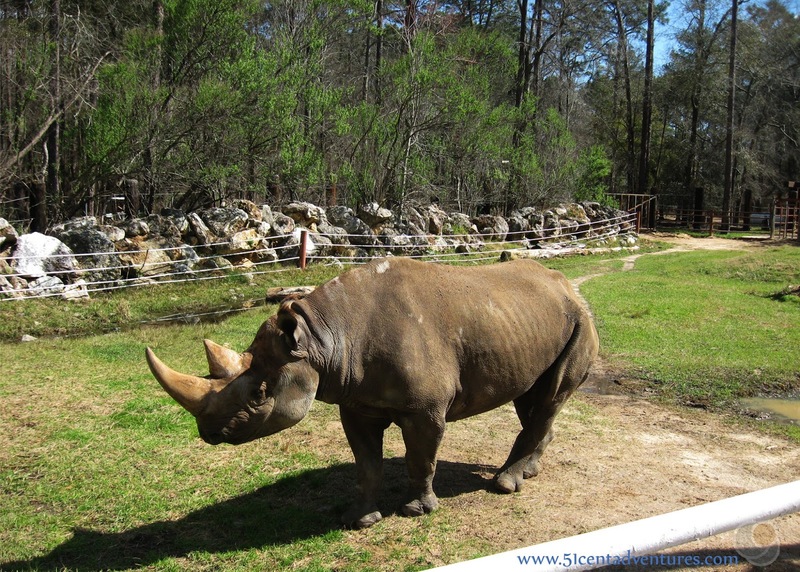 Chehaw Zoo didn't have large animals like elephants or giraffes, but it did have a rhinoceros. 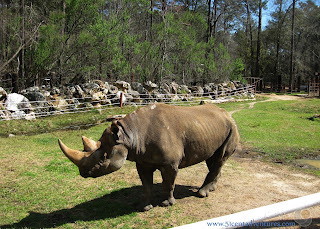 We were near the rhino pen right when it was feeding time. The zoo keeper had my daughter come and help her feed a branch to the rhino. This was the highlight of my daughter's week. 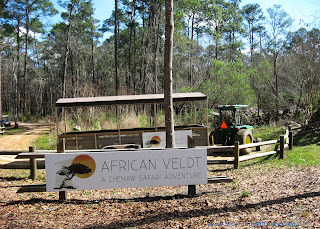 Even though the zoo was missing the big wildlife such as elephants, and lions it still had lots of interesting animals such as a cheetah, kangaroos, foxes, a wolf, emus, etc. My kids loved seeing all these different animals. They loved how close they could get to the meerkats. One thing I really liked about this zoo was how close we were to nature. Some zoos can have a manufactured feel, but this one felt very natural. 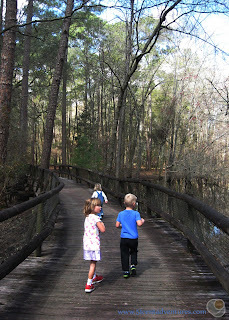 There were large boardwalks that took us through woods with trees that were just beginning to grow new leaves. That meant that this place would be shady and fairly cool even on hot and humid summer days. At one point the boardwalk turned into a suspension bridge. 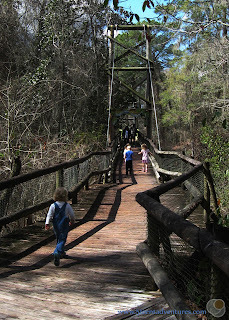 The bridge took us over some animal exhibits. Lemurs lived on one side of the bridge. The other side is the future new home of the wolf and I think the bear. The bridge will allow visitors a good look at these animals. This picture shows off several things. One, it shows how empty the zoo was. I really liked that it wasn't crowded. We felt like we had the place to ourselves most of the day. Two, it shows off the well maintained grounds and pathways. 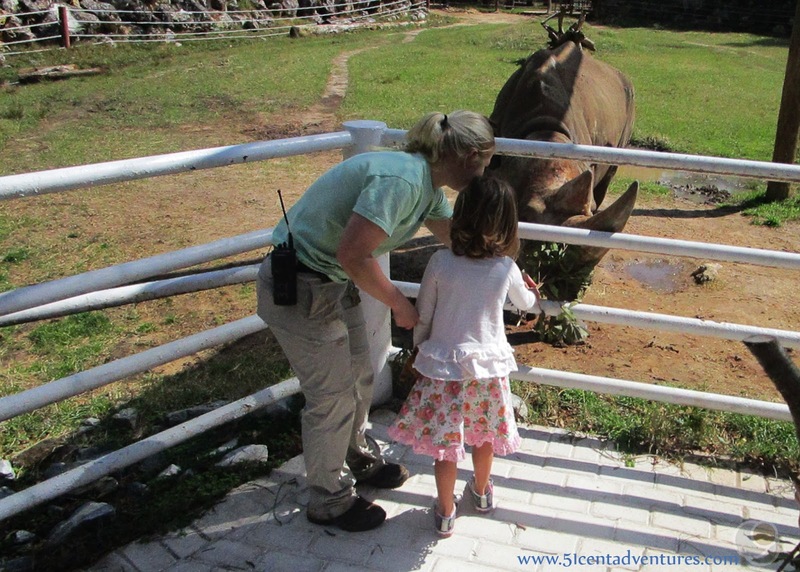 Three, it shows how happy my daughter and I were at this zoo. And four, it shows off how skinny I've become. I've lost 55 lbs in the past 17 months and I feel amazing! On weekends the zoo offers an additional attraction at no extra cost. They have a covered trailer that is pulled by a tractor. 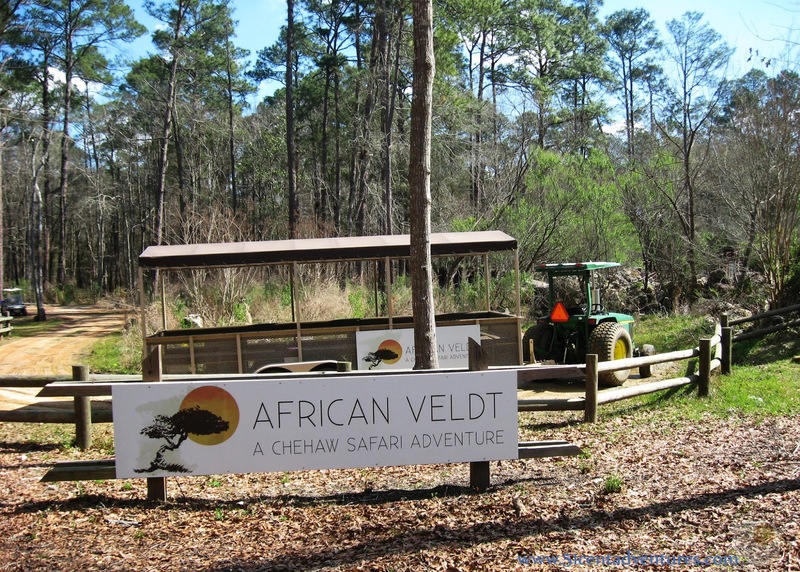 This the the African Veldt which is a safari type adventure. 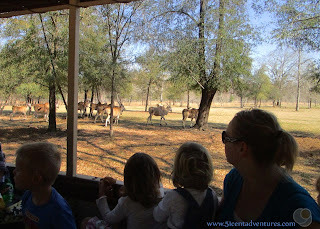 We rode out on the trailer and were able to see an ostrich, zebras, wildebeests, and a whole herd of elins. 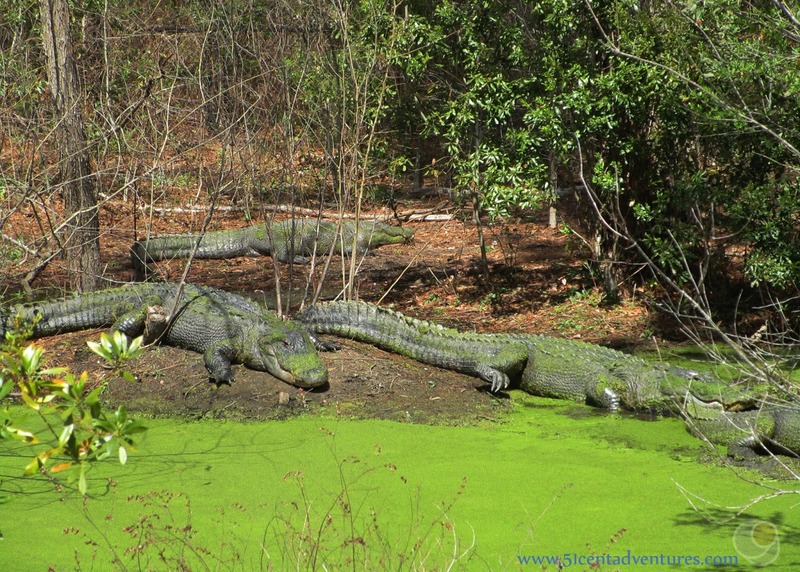 Another part of the zoo was a lake with alligators in it. My family was so surprised by this area. 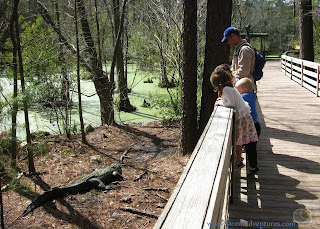 When I first walked into it I saw a large alligator laying right next to the raised boardwalk. I might have even let out a little scream when I saw the gator. But then I started to wonder if it was even real. It laid so still that it had to be a statue right? 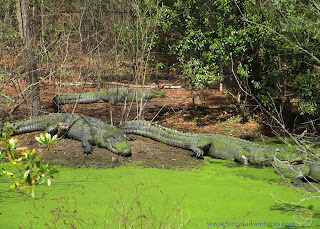 But soon I saw some other gators and these ones were moving just ever so slightly. I realized that they were all real and that they were all extremely near my family. It was unnerving in a really cool way. This added element of danger made this area one of the most memorable exhibits in the whole zoo. After we were done with the zoo we purchased tickets for the train ride. Each ticket was $3 which was a fairly good deal. 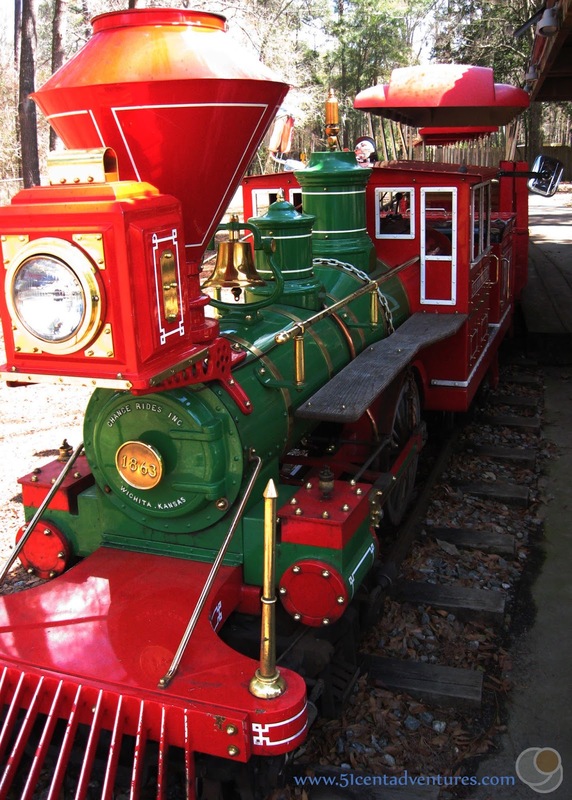 My son is obsessed with trains, and I once paid $3 a ticket to take my kids on a stupid little train ride around one block during the Fort Rucker Fourth of July Celebration. So I couldn't exactly balk at a $3 ticket for a twenty minute train ride. I thought that the train might take us around the zoo, but really it went through a wooded area of Chehaw Park. 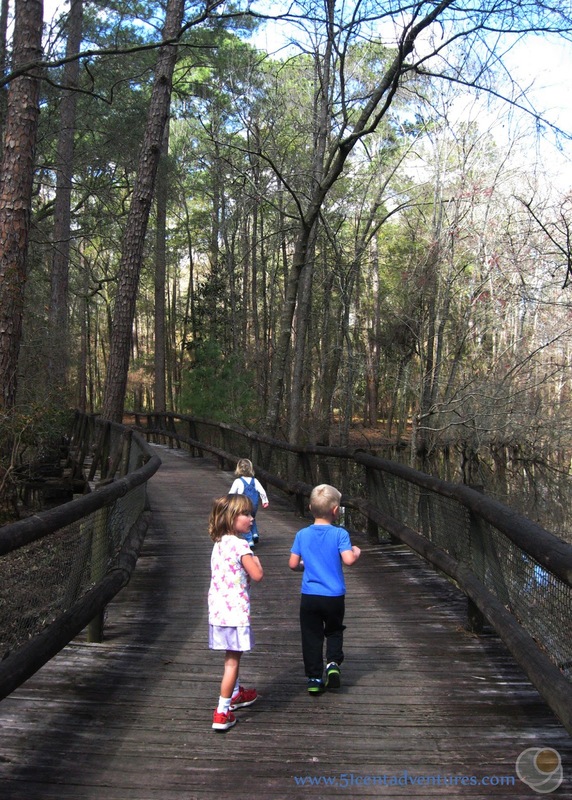 We were able to see some cute walking trails, and parts of the park's campground. All four of the kids love the train ride, but my son loved it the most. He was sad when it was over. When we were done with the zoo and the train we went to the playground that is inside the park. 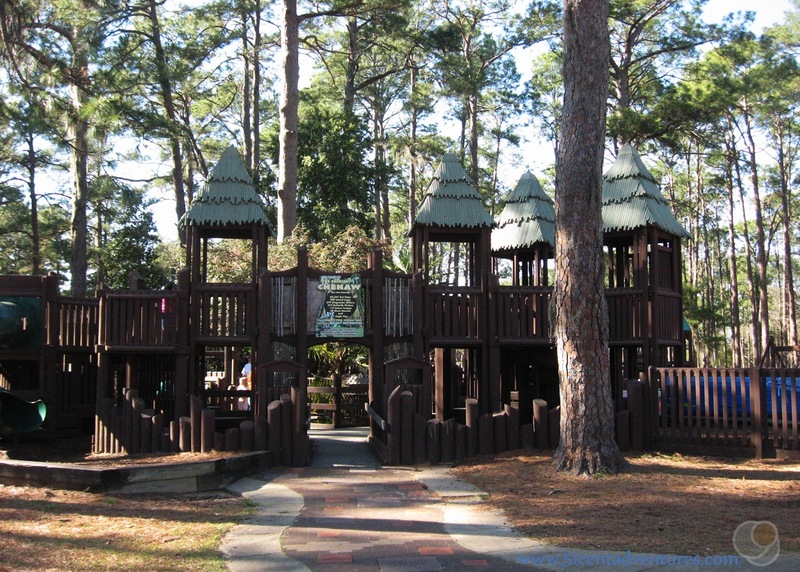 This play ground is billed as one of the best play grounds in all of Southwestern Georgia, and it did not disappoint. Even though the kids were getting tired they still played in the playground for another hour. The park closed at 6:00, and our kids ran out of energy around 5:30. We promised the kids that we'd come back again some day. We bid goodbye to the park and drove back to Fort Rucker, Alabama. The park and zoo had definitely been worth the drive, and we will definitely go back again some time. 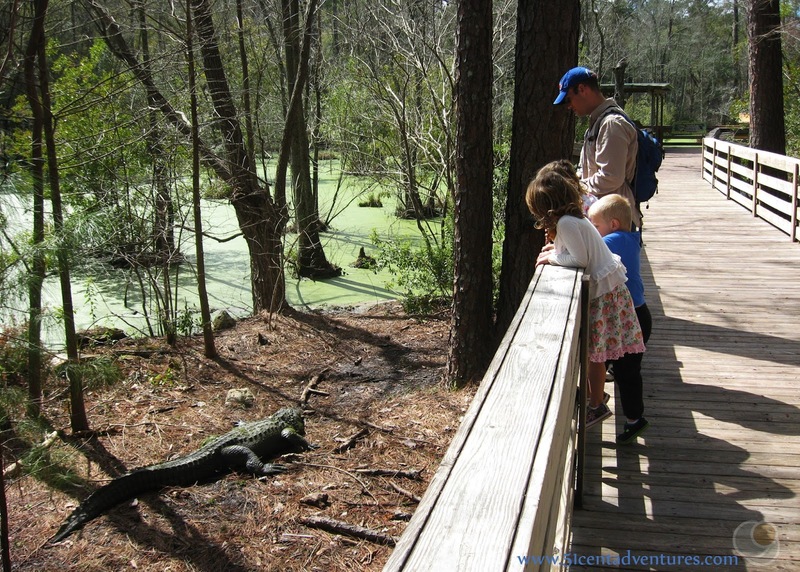 Recommendation: If you are looking for a low cost zoo then Chehaw Park and Zoo is the place to go. There is enough here to keep you and your kids entertained for the whole day. Directions: Chehaw Park is located on the northern side of Albany, Georgia. The zoo is located within the park. You'll pay for both things at the entrance station to the park. Places Nearby: Chehaw Park and Zoo is interesting enough that you could spend the whole day there. However, if you are looking for something else to do in Albany you might want to check out the Flint RiverQuarium. Tickets for that are $9 for an adult and $6.50 for children which seems like a lot of money just to look at fish, but it is a decent price for an aquarium.